Barack Obama has done more for the environment in a week than George W. Bush in eight years. However, the road is littered with obstacles, and the economic difficulties and challenges abroad can strongly influence any green advancement in the future. (From Madrid) DURING THE FIRST MONTHS of Barack Obama’s electoral campaign, the enviros were quite skeptical of the democratic candidate’s environmental proposals, but in a short amount of time, he won the respect of the majority of the most well-known ecological groups and lobbies with an aggressive climate and energy plan called New Energy for America. Together with Barbara Boxer (D-California) and Bernie Sanders (I-Utah), Obama was also one of the most aggressive cosponsors of legislation on climate change and emissions reduction during his tenure as senator of Illinois. Thanks to these actions, Friends of the Earth, Sierra Club and The League of Conservation Voters gave him unconditional support during the last leg of his race to the White House. One of the plan’s most important points is the utilization of an emissions quota system called a cap and trade system, the goal of which is to reduce carbon dioxide emissions by 80 percent by the year 2050. As such, the most pollutive businesses are those that will have to pay the most. The pollution permits will be subsidized in such a way that the money collected (more than 30 billion dollars) will be reinvested in the promotion of the use of renewable energies, in order to create green jobs and help those families with few resources deal with the increase in the cost of energy: gasoline and light. “Obama wants to put a million hybrid vehicles on the road, and all of the states to introduce measures like California’s” There are other interesting points worth mentioning, such as making 25 percent of the electricity consumed in the United States come from alternative energies by 2050 –30 percent in all of the federal administration’s offices–, or its intention to call for a 50 percent improvement in energy efficiency by 2030 and a greater utilization of public transportation. It also proposes the investment of 150 billion dollars within a period of 10 years for R&D in biofuels, renewable energy resources, clean coal and other clean technologies. Finally, Obama wants to put a million hybrid vehicles on the road and get all of the states in the union to want to introduce measures and air quality standards as strict as California’s. This point is driving the auto industry mad, since it will have to have to introduce modifications in the designs of its cars in a very short amount of time, and at a high additional cost. Obama will not have its support, and the industry’s lobbies will probably make things difficult for him. But the key question is whether all of these proposals will really see the light of day. Only one week after taking office as president, “Obama has done more in a week to reduce oil dependence and global warming than Bush did in eight years” Barack Obama has already taken his first environmental steps. Shortly, he will order all of the federal departments and agencies to look for ways to save energy, and for their activities to be more ecological. He will also talk to federal regulators about implementing stricter emissions reduction standards, above all for cars, and he will strengthen the EPA, so that the new regulations be rigorously introduced. Projects designed to create more efficient infrastructure to avoid wasting energy, such as the installation of 3,000 miles of high technology wiring and the utilization of intelligent electrical meters, are also included within his economic measures package. 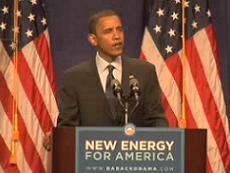 It is obvious that Obama has done more for the environment in a week than Bush in eight years. All of us who are worried by this issue can now breathe more freely… but the road is still littered with obstacles, and the economic difficulties and challenges abroad can strongly influence any green advancement in the future.